It was our last day at sea and as we woke we took stock of our view out of our window and tried to commit the beautiful blue sea and sky to memory. It really was going to be a bittersweet day. The last one on the boat, the last day spent with the Perrymans and the last day of relaxation in paradise. After breakfast I wandered round the boat with my camera taking pictures of everything I could so that I would never forget it all. The theatre where we watched so many wonderful shows, the different bars and staff members. 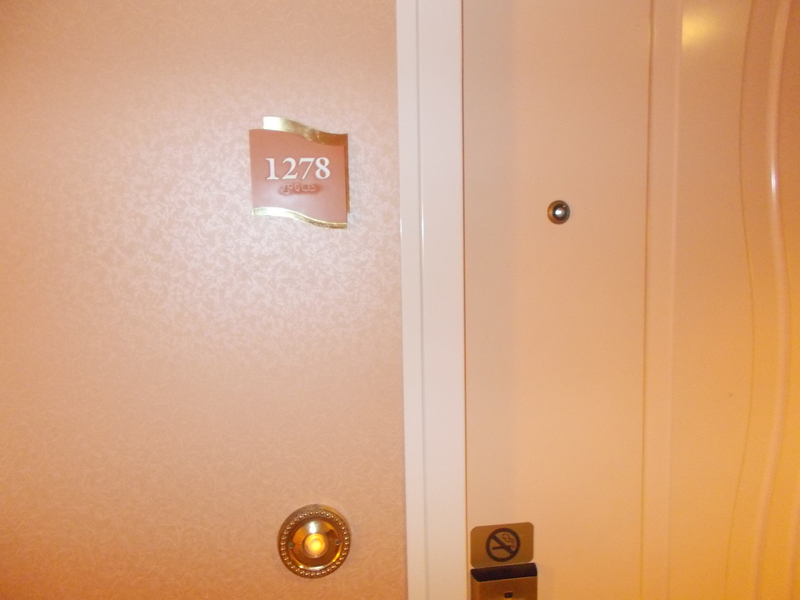 The ornate decor and of course our room number. This is a little ritual I have whenever I stay anywhere I always take a photo of my room door so I can remember the number. Weird I know but hey we all have our foibles. deck to the back end (no idea what this is called) and found a little area where they was no mad wind and waited for the others to turn up and find me. After an hour of reading alone I got bored and decided to brave the elements and try to find everyone. By the time I found them, down the other end of the ship clinging to their beds, I was tired from battling the wind and gratefully sat down. I had been sitting for no more than 2 minutes when I heard someone exclaim “Bloody hell look at that”. We all turned towards the sound of the voice to see an enormous black cloud coming our way pretty quickly. Before we could get inside the cloud passed over the ship, dumping its watery contents everywhere and carried on its merry way. Soaked but laughing we went back inside to change and had our rum guzzling session in the sports bar instead. Dinner that night was a really sad affair, the waiters all came and said goodbye and sang their last song. We had some photos taken to mark the occasion and then Diane told me she had bought me a little gift to remind me of her. 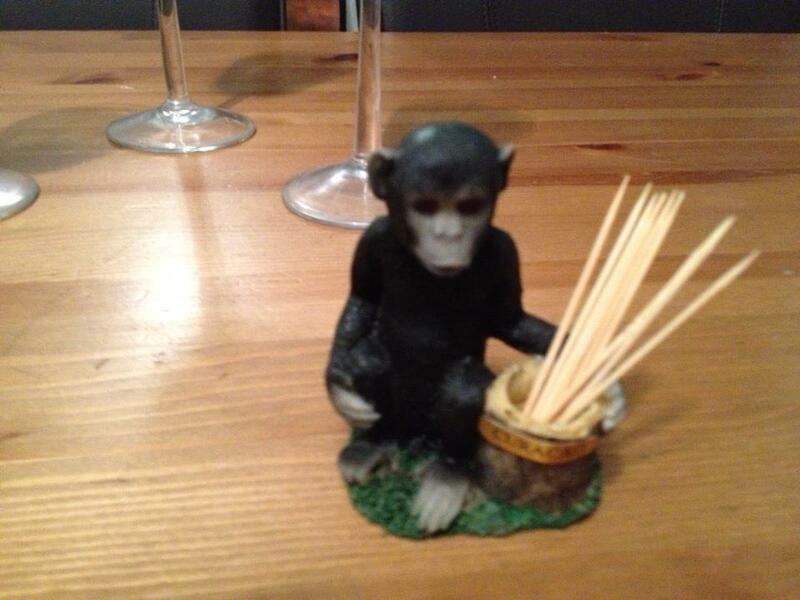 I was touched until I opened it and saw she had bought me a monkey toothpick holder. Laughing I promised that I would keep it on my dining table always. I have done just that and I am looking at it as I type. The next day dawned as beautifully as ever and we were in Puerto Rico again. We sadly went down to breakfast and ate our final meal. At 10am we left the ship for the last time and started our long long journey home. Puerto Rico to JFK, New York and from there to Heathrow. No problems flight wise other than the fact that on the journey to Heathrow we were flying at night and the plane was only about 1/3 full. This was great until I decided to lie down on a row of 5 seats to sleep. I had just dozed off when I was rudely woken by a girl in her 20’s telling me to move. She said that as she had sat at the end seat first she should be able to lie down. I pointed out that when I had chosen her row she was fast sleep in her chair sitting upright. Anyway the upshot of it was that I refused to move and she spent the next hour kicking me until I told her to bugger off. After that she left me alone but I never did go back to sleep. Arriving back in London we retrieved our luggage and went outside to catch the bus to the car park. Stupidly I was wearing only a thin dress and nearly had a heart attack when we left the airport to a temperature of approx 2 degrees. 3 hours later we were home. Sad but full of amazing memories. The welcome we received from our two dogs was enough to put the smiles back on our faces. So that is the end of Caribbean Chronicles. I hope you enjoyed reading it as much as I enjoyed reliving it. I have no other holidays planned just yet but do have a new plan for my blogs. April was A-Z month and although I don’t want to write a blog every day each time I do the subject will begin with the next letter of the alphabet. I think that will definitely prove to be a challenge with some letters. Well, we are coming to the end of our amazing holiday of a lifetime. Only 2 more islands to go. The first of these was Aruba, another of my favourite places due to the vibrant colours and happy people. The weather didn’t hurt either. We had tried to book an excursion on a boat where there was a rope swing out into the sea and scuba diving but unfortunately we got in too late and the tour was full. 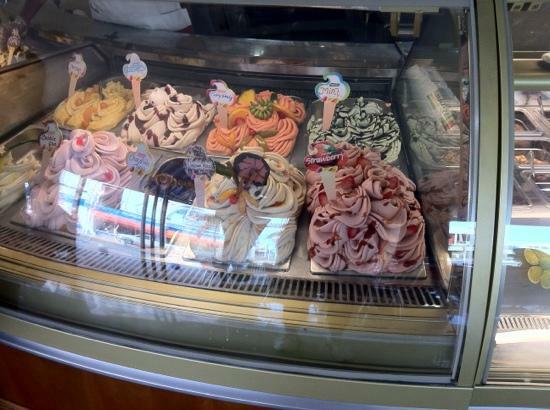 However later we went ashore for a little bit of shopping and what turned out to be an ice cream extravaganza. We met up with the Perrymans after lunch and decided to have a mooch around the shops and stalls ashore. There were so many wares on display outside it was difficult to tell which shop they belonged to and there were times when there was no assistant in the shop we were in because they were taking money in another shop for the owner there. A very strange but trusting way of doing business. First of all we went into a shop that sold alcohol and much to our delight they had rum in every flavour imaginable (including our favourite tipple, cherry) at a ridiculously cheap price. Needless to say we stocked up and then realised that we would have to carry about 12 bottles with us. The shop assistant kindly let us leave the drink there until we were ready to board the boat. So off we went, in the blistering heat along the main road where covered stalls had set out their stock. Everything from coloured flowers pots and fridge magnets to pieces of furniture made from gnarled varnished wood. Lots and lots of t-shirts, dresses and bra tops were on display but oddly enough none of them had any shorts for boys which is what I was after. Trevor had wandered off and came back looking very excited. He told us to follow him and led us round the corner to an amazing ice cream emporium called Lecca Lecca. Although I am not a mad lover of ice cream there was no way I could resist the bright colours of all the different flavours. All seven of us rushed in and up to the counter to see what they had to offer. 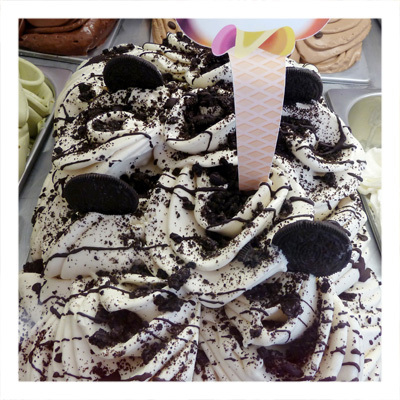 So many flavours, rum and raisin, orange sherbert, chocolate chip (white and milk), pineapple, mint, mango, coffee, tiramisu, bubblegum, cookies and cream and even carrot sorbet. I really could go on. There were sprinkles, nuts, sweets and sauces to add if you wished too. Just remembering this fabulous shop is making my mouth water. Once we had had our fill we wandered back out into the heat and carried on shopping. Aruba is so lively and probably the most modern island we visited. The streets appeared to be newly paved and the shops fronts were pretty ornate. The roads were wide and busy with cars and buses and Caribbean music was being pumped out of shops and stalls alike. It really was a place where you could indulge all your senses. After a few purchases we made our way back to the boat for pre-dinner drinks, not forgetting to collect our rum. I was sorry to leave Aruba and would have liked another day there. 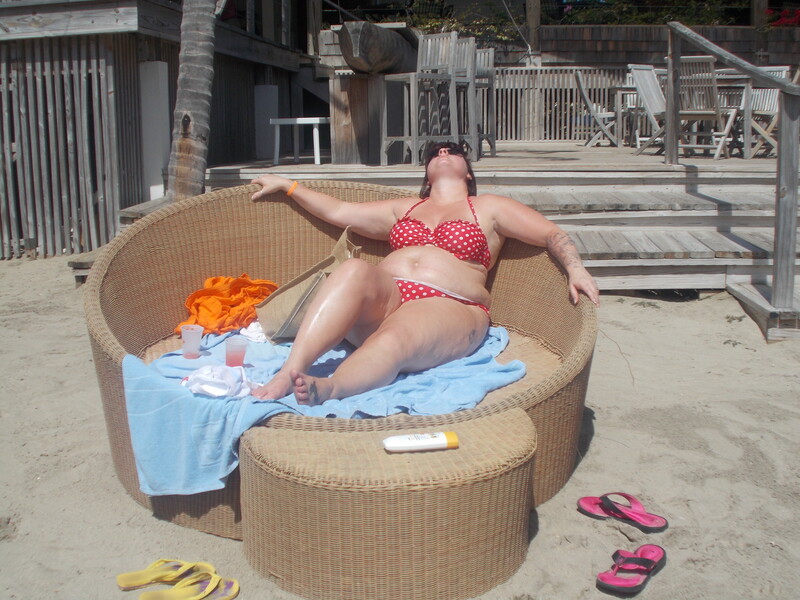 But, the next day we were in Curacao and, much to Sams delight had a date with some dolphins. Conversely, Curacao was the island that I liked the least. It was very run down and unkempt and seemed dowdy in comparison to Aruba and Barbados where bright colours and music were all pervading. The people didn’t look as happy that we were there and our welcome onto the island was all but nonexistent. 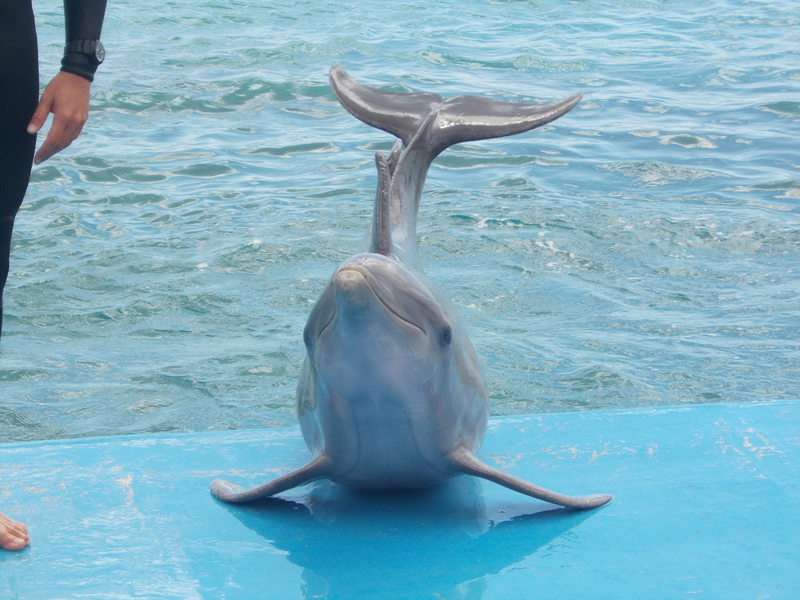 But, we were going to play with dolphins so we put that to one side and looked forward to the trip. After a bus ride of about 20 minutes we pulled into a park and were let out, with strict instructions to be back in 3 hours. We were then separated into group and led into a theatre where we were shown a safety video. After a bit of hanging around we were taken outside to see the dolphins and their trainers. We were then split into smaller groups and assigned a particular marine mammal. Ours was called Buscoo and had a broken fin from getting caught in a boats propeller when she was out in the open sea. We waited around some more and finally we met Buscoo’s trainer and got into the water. We stood in a line on a ledge about waist-deep in the water and Buscoo swam past us so we could stroke and tickle her. The trainer got her to do some tricks and gave us the commands she recognised so that she would clap her fins on our command. After about 15 minutes a photographer came along and took photos of us kissing the dolphin and some of her kissing us, a weird experience being kissed by a fish. (Yes, I know a dolphin is not a fish, but it certainly felt fishy when she kissed me). Once we left the water we still had about 45 minutes to wander around and look at the other water creatures in display pools and then just before we departed we watched a dolphin show where all the inhabitants got to show off their skills. It was a great experience, one that Sam will treasure forever I hope. Happy and tired we boarded our bus back to the boat. That night at dinner we felt a little sad that we were now at the end of our cruise and we were on our way back to Puerto Rico to begin our mammoth journey home. Next time, our last day at sea and trip back to Blighty. Well hello there my loyal followers. Once again I apologise for the hugely long gap between posts but upon returning the to snowy UK I felt quite despondent and not in the mood to write about my fabulous holiday. Then just this week I had an operation (which I am sure I will be posting about soon) and now I am finally back in the writing saddle and ready to tell you more about the beautiful Caribbean. So, let me start by saying I hate monkeys. I mean really detest them. I don’t like their deceptively cute faces, their human-like grabbing hands and the one with the big pink bums just freak me out completely. What has this got to do with my tales? Well read on and you will be enlightened. 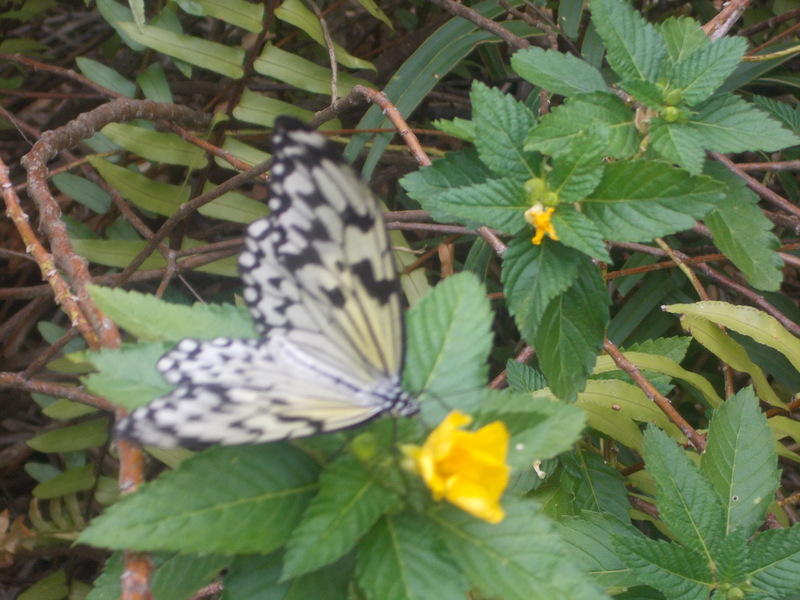 After the passenger swap at Puerto Rico we set sail for St Thomas where we visited a little butterfly farm. I love butterflies but these were a little disappointing as there only seemed to be a few species there. Nevertheless it was a nice little interlude and we ran back to the boat just as we got hit by a brief downpour. The turn in the weather meant I could go back to the cabin and read (and sleep) the afternoon away. 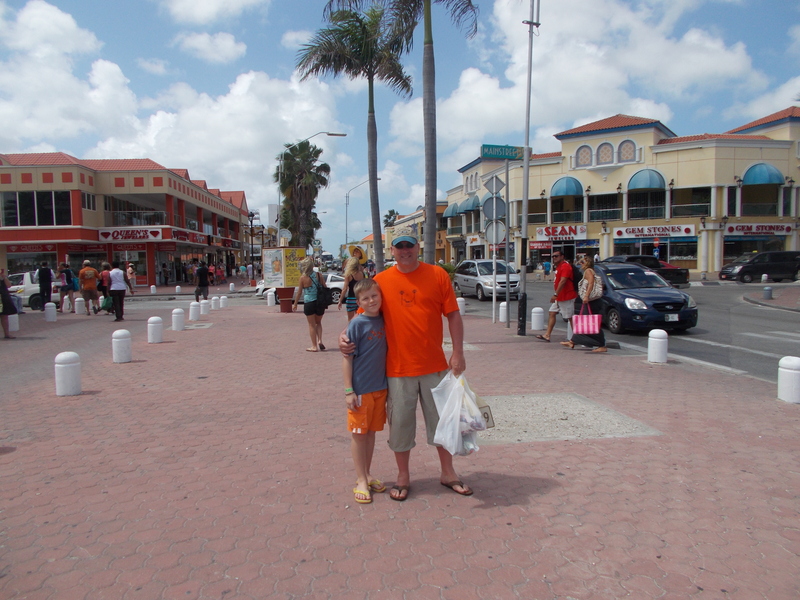 The next morning we arrived in St Kitts, which as it turned out was one of my favourite islands. I had booked Trevor on a cooking excursion where he went to a manor house and learnt to cook the Caribbean way. He was very excited to get going and so were Sam and I as we were going to a fabulous beach where we would have lunch and play in the sea. We left the boat and walked to the meeting point where I realised that I had forgotten my sunglasses and my book. Luckily we had time for me to run (!) back and get them. Running is not my forte and running in 40 degree heat is torturous but I made it just in time to get on the bus and off we went. St Kitts is an up and coming island where tourist resorts are expanding very quickly. It is a beautiful place with amazing views and cute little mountainside houses. The tropical weather just tops it off. The roads are typically unkempt though and whiplash is always a risk, but we got to our destination safely and alighted the bus onto a strip of white sandy beach complete with loungers, parasols and restaurant. 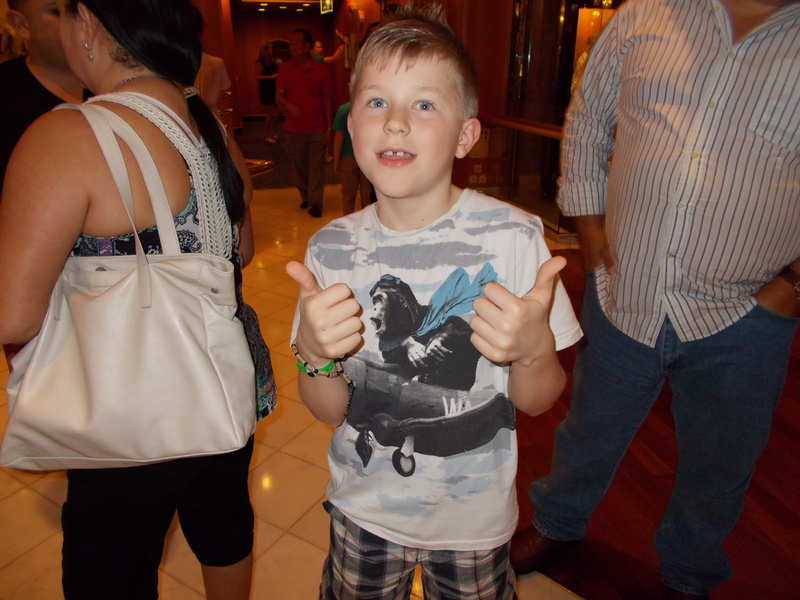 Suddenly, beside me, Sam became very excited, jumping up and down and pointing. Following his excited gaze I was dismayed to see a man holding…… yes you guessed it a monkey. But not just a monkey. A monkey wearing a NAPPY. Urgh!! I shuddered but of course the man had seen Sam’s excitement and was making his way towards us. “$5 for a photo with the monkey” he informs us. I wanted to tell him I’d give him $50 to bugger off but Sam’s pleading face stopped me. 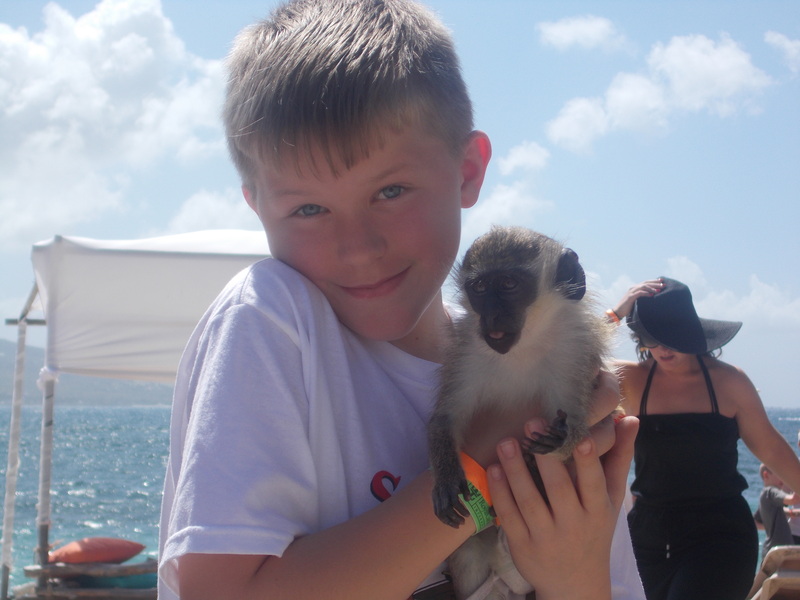 I told the guy that I had no money but I’d let Sam hold the monkey (again I say Urgh!!). The guy agreed and passed the offending creature to my son. Once he looked away I quickly snapped a couple of photos of my own, for free, and instructed Sam to give it back. Thankfully the man took it away and I relaxed. For all of a minute. To my left I saw someone else approaching us. Another man with a nappy wearing primate. Ah maaan! not again. I made my distaste perfectly clear by vigorously shaking my head and indicating for them to back away. To give them credit, they didn’t push themselves onto us at all and quite happily moved on to the next monkey loving weirdos. Sam was happy and ran off to play in the sea. I found an amazing lounger and settled down with my book. After a gorgeous lunch and a little bit more monkey-avoidance we boarded the bus for a bumpy ride back to the boat. Trevor was already back and told us of his cooking prowess and when Sam told him about the monkeys I am sure I saw Trevor laughing behind his hands, but I may have been mistaken. So St Kitts slowly disappeared behind us as we sailed off towards Aruba. Until next time my salty sea dogs. Sorry for the long gap between posts, loads been happening but anyway to continue the story. The next day was Barbados. Sam and I had been looking forward to this island especially as we were going to swim with turtles later that morning. My boy was full of confidence now that he had walked underwater with a huge helmet on his head and he couldn’t wait to get going. The day was blisteringly hot so I ordered Trevor to cover up completely and stay out of the sun as the colour of his body was still reminiscent of an uncooked salmon. We walked into the port terminal and picked up the tour bus which drove us a short way to a 5* catamaran crewed by 5 lively guys. Loud music was played, rum punch was poured and we were off to swim with turtles. After about an hour the boat stopped and we were issued with snorkel gear and given a quick lesson on how to use it. Then we all gingerly climbed into the perfect blue waters. 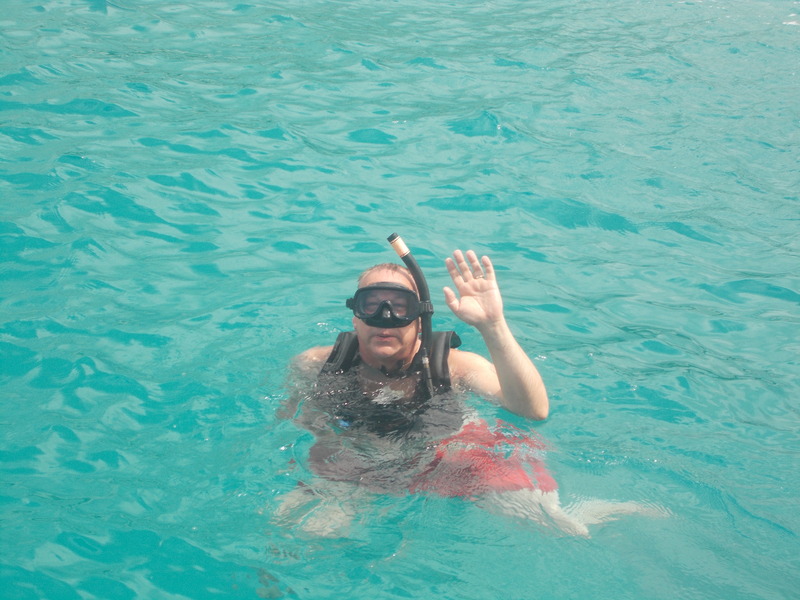 Having never snorkeled before I found it hard to keep the tube in my mouth and breathe normally without gallons of salty water pouring down my throat. After a while I got the hang of it and happily swam around looking at the beautiful coloured fish, completely different to the ones we had seen in St Maarten. I looked around and saw that Sam had taken to snorkeling like a duck to water (cliche intended). He was swimming next to his dad happily but for those of you who know Sam know that he cannot stop talking, so was constantly spitting out the tube and mouthfuls of water in order to tell us where we should be looking. The crew had also jumped in the water and was throwing out bits of bread and before we knew it we were surrounded by huge sea turtles. They joined us and swam alongside us as if we were all the same species. Occasionally one would bump me and I’d turn to say sorry (as any good Brit would do) before reaching out to stroke his hard shell. We swam for about an hour all told and then be climbed back on board the catamaran. The captain, a craggy faced man called John called Sam up to the helm and let him drive the boat home. It was a great day, one that Sam will certainly never forget. We had an underwater camera that we used but I have yet to have the photos developed so fingers crossed there will be some great pics for you to see soon. Meeting our new friends for pre-dinner drinks, a great meal and then post dinner drinks was becoming a habit we could fast get used to. Diane had burnt her nose quite badly and endured constant teasing from me about the lovely scab and when we had our photo taken at the meal I promised I would buy the picture just so I could have a lasting memory of her hooter for future amusement. Everyone seemed to be miffed that for some reason I was the only one going brown while everyone else turned varying shades of pink. In fact, in the photos we have commented that it looked like I have been on the cruise for months while they had only just joined. 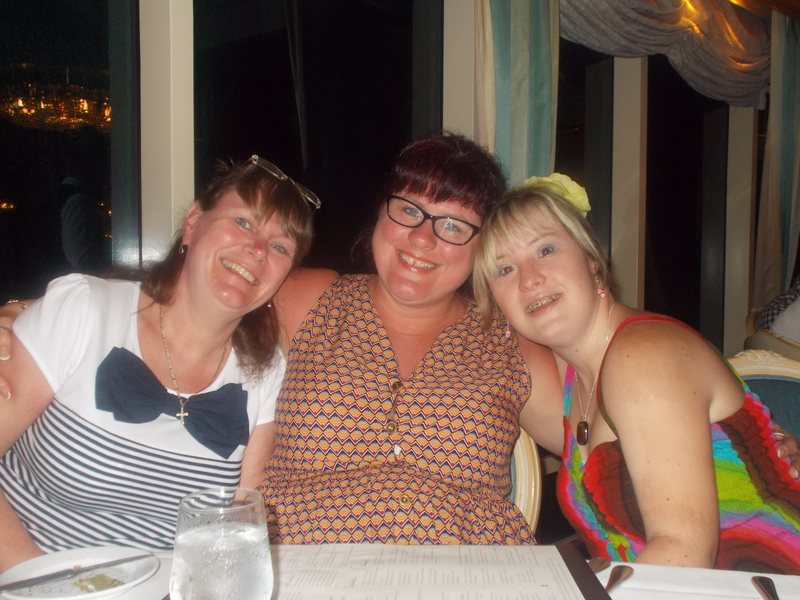 Me looking tanned with Diane and Zoe not so much. 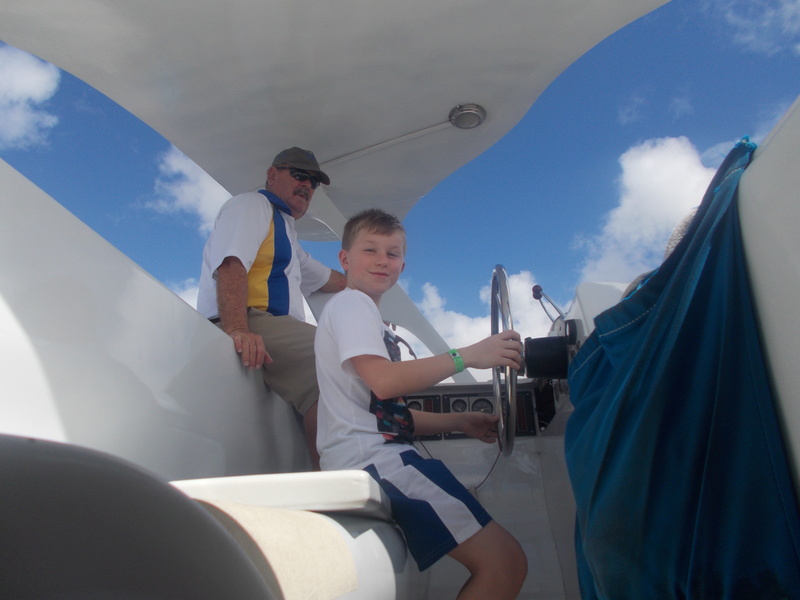 That was almost the end of our first week, we just had one day at sea while we sailed back to Puerto Rico to pick up the next lot of cruisers and drop most of the current lot off. We had decided that we would use this day as a day of rest (ha ha) and to work on our tans. Obviously this was to include copious amount of cherry rum and cocktails of the day but that goes without saying by now. In the afternoon I had my spa appointment. This was an aromatherapy relaxation pod, a half hour treatment in an enclosed pod where you relax and afterwards feel as if you have had 3 hours sleep. Marvellous. I was imagining being taken to a quiet room filled with aromatic oils where beautiful music was being piped through the walls and where I could close my eyes and drift away for a lovely rejuvenating half hour. However, as seems to have become the norm, I was completely wrong as I was taken down into the gym where a large pod that looked a little like a flight simulator was positioned in the middle of the floor. I was instructed to get in and then it was closed, albeit my head was sticking out the end. Then after 5 minutes of trying to find the right button to press the instructor flashed me a blindingly white smile and said, “Now Mrs Julie, just relax. I be back soon.” Off he went and the pod burst into life. Well that’s not entirely true. The seat became warm and puffs of hot air were blown up and down my body. There were no gorgeous smells and the pumping of the gym music was all I could hear along with the grunts of over developed males lifting weights the size of cannonballs. Half an hour later, the pod had fizzled out and the instructor was nowhere to be seen. I lay there for a few minutes until boredom started to set in and I started to feel a little foolish with my head hanging out the end of a flight simulator smiling at the gym goers as they passed by. In the end I called out “Hello” a few times and sure enough, Mr Bleached Teeth released me from my prison. “You, like?” He asked. I didn’t really know what to say so I just nodded and mumbled something incoherent. He seemed happy enough and shook my hand vigorously as I left saying loudly “Thank you Mrs Julie. you come soon back”. So, week one was over. But fear not my salty friends there is much more fun to be had in week two. Next time we hit St Thomas and St Kitts where I face yet another fear but this time lose dismally. First stop St Croix, US Virgin Islands. After a pretty restless night, sleeping in a new bed in a room that moved I woke up to hear Trevor and Sam chatting on the balcony. Stepping outside I walked into a wall of heat and had my first glimpse of St Croix. Pastel coloured houses nestled into the side of the hills and as I looked along the jetty to the white sandy beach I could see a row of brightly coloured shops and cafés. It was 8.30am and people were already streaming off the boat towards the little town. From my vantage point on deck 10 they really did look like loads of little worker ants. 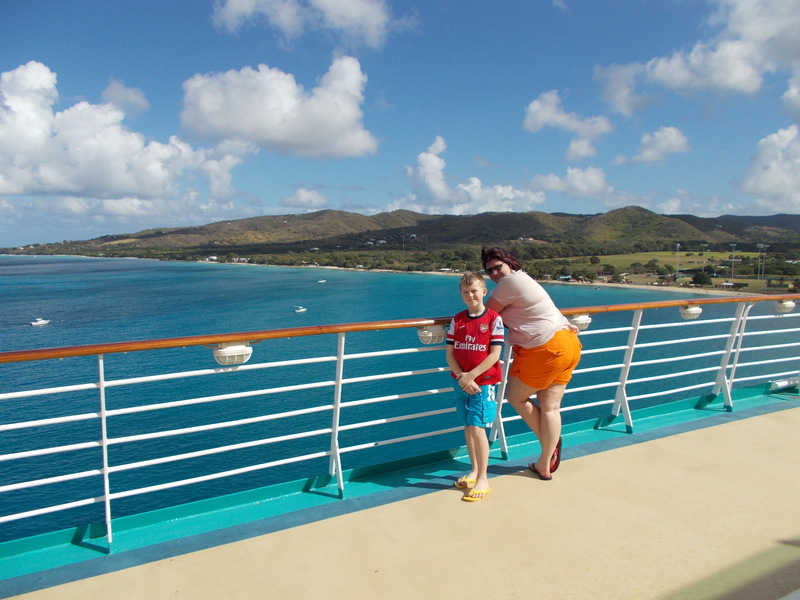 However, before we joined the throng into St Croix we wanted to explore the ship a little more. 14 decks to be discovered. 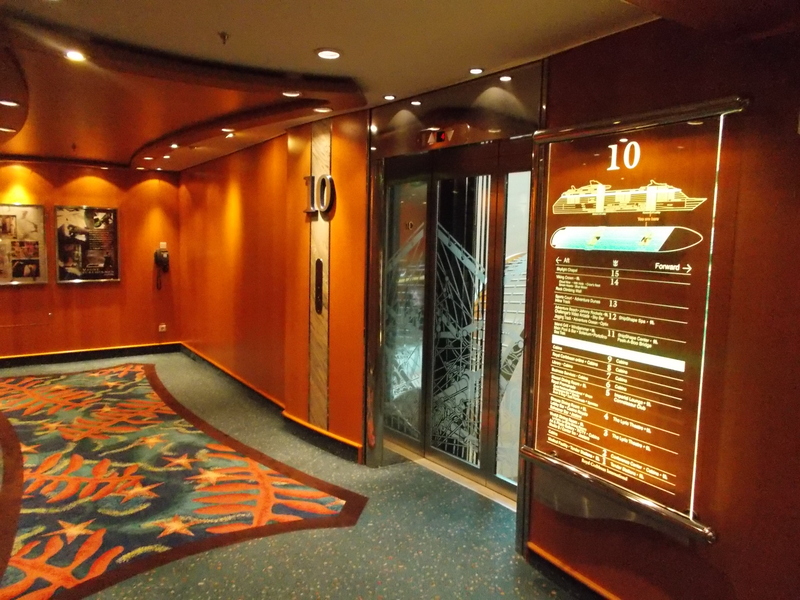 We had already found the promenade on deck 5 with the shops and eateries and a four piece jazz band constantly performing happy lively music so we ventured further afield, this time to deck 12. 4 jacuzzis, two salt water pools and hundred of sun loungers were situated at the front of this deck. A running track snaked its way round the whole of the top of this (although why anyone would want to run in this heat is beyond me). 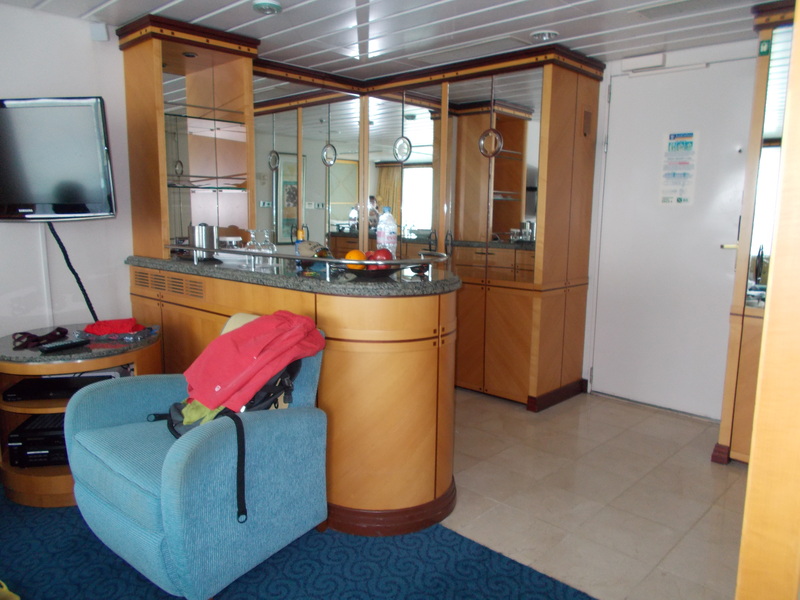 Deck 13 was accessed by steps leading from the pool deck to, yes another pool deck and hundreds more sun loungers. Even with 3000 people on board you can never feel cramped here. The view was the most beautiful thing I had ever seen, and it wouldn’t be the last. Vast blue sea, the bluest I could have imagined as far at I could see, meeting the pale blue sky of the horizon. With the sun glistening off the waves, this was paradise. Anxious to get into the little town, we changed into shorts and T-shirts and I mentally apologise to the citizens of USVI for my pasty white body desperate for the sun to change its hue. “Welcome to St Croix”, a security official invited us through a gate into a little square of palm trees, bright colours and Caribbean music. Little trinket shops had Sam reaching for his money to buy his first souvenir. After about half an hour we stopped in a little café for a snack where I was offered an iced blueberry latte. As weird as it sounded it was delicious, like a muffin in a cup. Afterwards we took a little stroll on the beach before it was time to head back to the ship for dinner and evening entertainment. 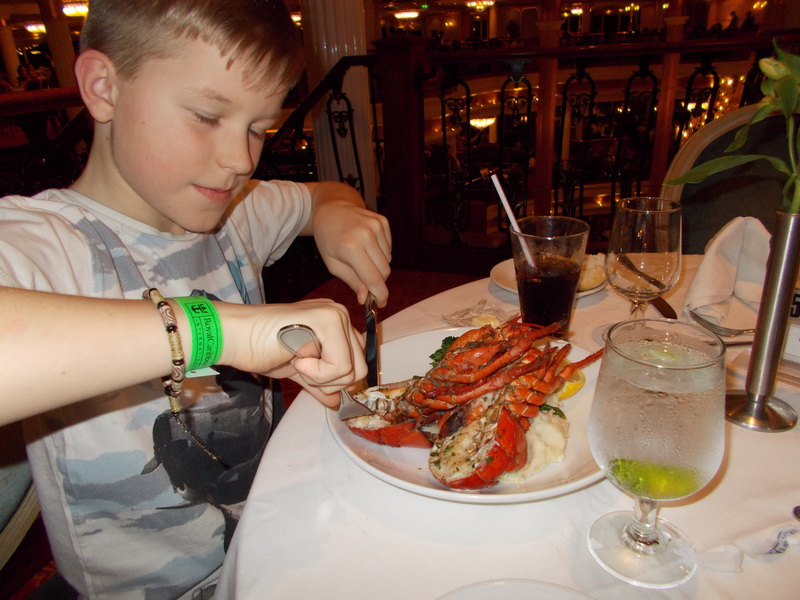 Sam has been on at us for ages that he wants to eat lobster and luckily for him it was on the menu in our restaurant of choice that night. He did baulk a little when it appeared in front him, eyes and all but to give him his due, he ate it all. Trevor was also relieved as it was the only thing on the menu that cost extra so at least it wasn’t wasted. Bellies full we wandered down to deck 3 into the Lyric Theatre where we were shown to our priority seats, definitely the best in the house. We were treated to a fantastic show from the 16 singers and dancers, completely up to Broadway standard and I hankered back to my youth and my time on the stage with envy of these talented performers. Afterwards, weary and sun kissed we went back to our cabin and sank into bed. The next day we arrived at our second port of call, St Maarten where Trevor informed me that we were going to walk under the sea wearing a huge helmet. Although I had no idea what he meant, I was looking forward to it. First, though we made a trip off the boat into the tax free shopping centre just on the island. Sam bought a jazzy Caribbean shirt and decided to wear it straight away. Once back on the boat we got changed into our swimming gear, grabbed towels and the underwater camera and off we went. A short boat ride took us to a catamaran moored just off the shore and we were given a talk by a Canadian guy called Mike. He showed us the huge helmets we would be wearing that weigh 75 pounds. However once in water they become almost weightless. They looked like something an astronaut would wear with a big handle on the top. We would then walk down a ladder off the side of the boat into the sea, 20 feet down where we would then be taken around an underwater trek. I was very excited now as was Trevor. Sam, however was nervous and wasn’t sure he was going to do it. After some encouragement from us he said he would give it a go and the crew said that they would stay with him so that if he wanted to go back up they would take him. Trevor went first and I followed with Sam by my side, but only two steps down the ladder he panicked and was brought up again. I didn’t want him to worry so I said I’d stay with him but the crew wouldn’t hear of it and assured me that Sam would be fine and that they would convince him to come down. The helmet was placed over my head onto my shoulders and I started the descent. As soon as I went under I was surrounded by the most beautiful tropical fish that darted around me in shoals, never once bumping into me. 20 feet is a pretty long way down and I had to pop my ears a few times before I reached the bottom where everyone else was waiting. We were standing on a wooden path flanked by a rail to hold on to. As we waited for the rest of the crew to join us I figured Sam had backed out but all of a sudden I saw his little feet descending the ladder holding firmly onto the hand of the girl diver. Both Trevor and I beamed at our little boy and his bravery and the girl handed him over to Trevor but stayed by his side the whole time, just as she had promised. As we made our way along the trail the crew coaxed various sea life creatures to us and gave them to us to hold if we wanted. The first thing I held was a huge water spider, something that no one else wanted to touch. It crawled up my arm and felt like sticks poking at me, very strange. A little further along I put my finger into a sponge which sucked onto it, again a very strange feeling. The next thing I was given was a big sea urchin placed in my palm. The girl diver indicated for me to turn my palm face-down and when I did I felt the urchin’s suckers grip my hand and when it let go I felt the popping of each sucker as it released its hold. Although Sam didn’t want to touch any of the sea life I was still so proud that he managed to walk the whole trail without panicking and going back up. Trevor took loads of photos with the underwater camera but we have yet to see if they came out or not. After an amazing experience we travelled back to the dock by boat and then boarded the ship once again, just in time to change for dinner. Next time we visit Antigua and St Lucia. Finally, after the mammoth journey, we were in San Juan and as I woke up to the sun streaming into our hotel room I felt myself start to relax. Trevor was looking out of the window and told me he could see the ship. Scrambling to look I was awed by the size of the huge boat which had docked in the harbour just across the road. Once Sam saw it he was almost impossible to calm down and started leaping around like a gazelle. After a lovely breakfast of eggs, French toast, bacon and orange juice we brought our cases down to the bell boy and waited to be told where to go. After what seemed an age but was only an hour and half we were directed to a bus for transfer to the ship. One of the other passengers told us to expect boarding to take time as we had to have a sea pass created with all our details on so we could come and go from the ship as we pleased. Plus, with almost 3000 people boarding that day it was unlikely it was going to be a speedy affair, but once again I was wrong. At least this time it was in our favour. When we arrived at the dock we had to show our papers to the security officer who was directing everyone to join one of 3 queues, all of which we fairly lengthy. However once we produced our papers the man’s face broke into a huge smile and said “Aaah you have a suite you are very special guest.” It was true, I had decided that as this was going to be the holiday of a lifetime for us, I wanted to do it properly and had spent extra money booking a Grand Suite with a balcony so that we could enjoy watching the ocean and sunsets and beautiful scenic views. The guy led us past all three queues straight to the front of the boarding line and showed us straight to the desk where our sea passes were made up in record time and before we knew it we were boarding the Adventure of the Seas. The whole process took about 5 minutes and I have to say it was amazing walking past the hundreds of people queueing for about the 50th time but this time in the boiling heat. We stepped into the belly of the ship to be greeted, by name, by some of the staff and told to go and have lunch and wait for our cabin to be ready. Wow this was starting off very well indeed. Stepping into the glass lift and pressing floor 11 as we had been directed, we watched as we ascended over the most fabulous promenade. Shops, cafes, bars, even an English pub all waited for us to explore. Everything seemed to be made of gold from the handrails to the fixings for the gigantic chandeliers which hung everywhere. Never in my life had I seen such ostentation done so well. Calypso music welcomed us to the 11th floor where we were shown into the largest buffet restaurant I had ever seen. Sam’s face was a picture with his mouth open, for once not having any words. So, we come to the food. Everyone I have ever spoken to about cruising has told me that the food is spectacular and that there is nothing like it. Yep that pretty much sums it up. Salads, chicken, fish, fruit, pasta, soups, breads, desserts, every type of food imaginable was there for our enjoyment. I can only begin to imagine how many people it takes to make this amount of food 3 times per day every single day for 3000 people. Not only that but this was one of about 8 restaurants on board, mind-blowing. I can’t even remember what I ate now, I just know it was delicious and I am so glad I am not on a diet right now. Soon enough an announcement came over the tannoy system that cabins were ready so we excitedly rushed to find ours. Of course that was easier said than done and we got lost at least three times, ending up in the theatre, the ice rink and the promenade before finding out corridor. Sam put the car key in the lock and pushed open the door to our suite. WOW! A huge double bed, a sofa bed, a beautiful bathroom, a mini bar, big flat screen TV and a double balcony were ours for the next 16 days. Not too shabby for Mrs Julie (as I was to be called from now on by the staff). We could certainly get used to this, especially when we found out that we have our own personal concierge, Fernando who makes up our room twice a day, and who gave us his card telling us to call him any time if we needed anything. We found out later that the general sea passes are blue whereas ours are gold and it is a great buzz to produce it and be given special treatment like VIP seats at shows, priority dining, and access to the VIP pre dining area. 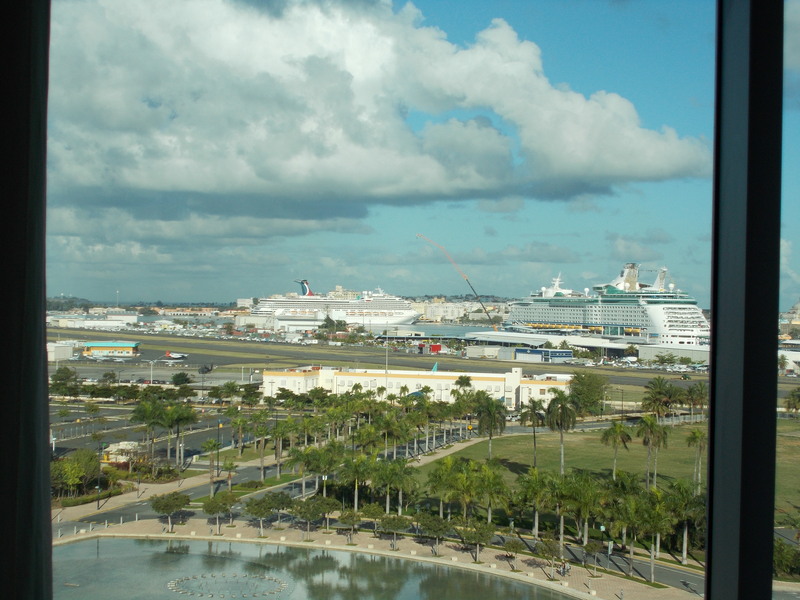 We set sail at 8pm on an overnight cruise to our first port of call St Croix in the US Virgin Islands. 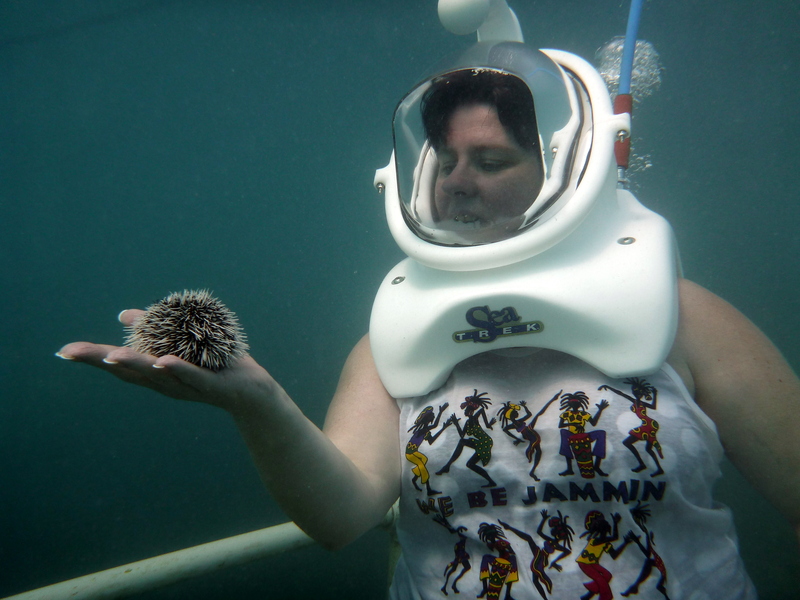 Don’t go away, my next blog will tell you all about St Croix and our next stop St Maarten where we had an amazing encounter with a huge astronauts helmet and millions of tropical fish. Our mini bar area, stocked I may add. Ahoy there mateys, til next time. I am sitting on the balcony of our gorgeous suite aboard The Adventure of The Seas watching the shoreline of St Croix, US Virgin Islands slowly receding. I wipe my brow, turned my face toward the gentle tropical breeze and spared a thought for my friends and family back in a snowy UK. Pahahahaha like hell I do. I am enjoying this Mai Tai far too much to sympathise for long. So, let’s start from the very beginning. We left our house on Friday night to stay in the Holiday Inn at Heathrow in preparation for our flight on Saturday. As excited as we were, we didn’t really expect the journey to be a problem but long haul flights with connections have been an issue for me in the past. (Read Costa Rica Tales for my first hellish journey this way). We were flying to Miami and connecting to Puerto Rico. Simple? No! To be honest, the ten hour flight into Miami was fairly pleasant, long but not too painful. The real problem started when we arrived at the gate to disembark. The seat belt sign flicked off and everyone stood up and struggled to get their hand luggage* out of the overhead lockers elbowing people in the head in their rush. Then we waited and waited and waited a little more. By now people had sat back down and grumbles about missing connecting flights could be heard. After about 20 minutes the captain’s voice came over the tannoy informing us that the ground staff were having trouble connecting the walkway to the door of the plane. I’ve since thought about how that could possibly be. Had our plane shrunk in height during the flight? Were the ground staff incompetent enough to be trying to attach the wrong end? I’ll never know and frankly 45 minutes later no one much cared as we were all making noises about missing our next flights. As we still had two hours before our plane left I reassured Trevor that all would be fine. Of course I had forgotten about the joy that is immigration. Eventually the pilot gave up waiting on the ground staff to secure the walkway and moved our plane one gate over where we disembarked 50 minutes after landing. Lots of the passengers started running to collect their suitcases and continue on their journey but of course we still had plenty of time until our flight…. Yeah, scratch that, we quickly came to a huge long snakelike queue that seemed to be at least two miles long, to get through immigration and our hearts sank. Like all the other sheep we joined the end and slowly shuffled along, left and right through the lanes until we reached a tiny little female security officer who directed us to stand in another queue to get to the immigration officer. Trevor was geting increasingly agitated, Sam was becoming bored and I tried to keep smiling and reassuring everyone that it would all be fine. However, I nearly had to physically restrain Trevor, when, just as we got to the head of the queue a man came and stood in front of us without explanation. It turned out that he hadn’t filled in his forms correctly and had been sent away to do this and then rejoin the queue at the front. Of course it would have to be our queue. Luckily for this guy’s health he didn’t take long and we were soon through the other side. Now even I had admitted defeat and we began running to pick up our cases with less than half and hour to take off. 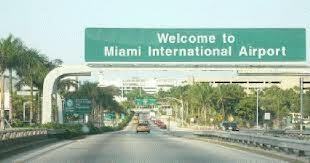 I now knew that Miami is my nemesis. The last time I was here it claimed me for the night (and then charged me for the priviledge) and now it looked like it was happening again. Ten minutes later, cases claimed and dropped off again, boarding passes at the ready we hit security again. I wouldn’t mind but we were not even leaving the damn airport but still were subjected to these rigorous searches. So belts, shoes, watches and all manner of other items came off and half naked and clutching our trousers at the waists we sprinted the final hurdle to Gate 48, the farthest gate in Miami Airport, of course. As we hurtled along I contemplated grabbing the mobile defibrilator that was conveniently placed along the concourse for other victims of Miami’s missed connection marathon. Gate 48 finally appeared and as we reached our goal with two, yes TWO minutes to spare the information board flashed up “Flight 1299 to San Juan delayed 1 and half hours” We had no words, just where the hell was that defibrilator? You can’t make this stuff up. So, the rest of the journey to our hotel in San Juan was fairly uneventful but I don’t think any of us had ever been so glad to see a bed. Next time, we board the boat and find out what it is like being VIP’s. *What the hell is this thing that people have about hand luggage? They seem to take mini suitcases into the cabin now and then spend ages trying to stuff them into the overhead lockers along with all their duty free. I wouldn’t mind but no one ever seems to need what they have in there during a flight.